SiteGround Hosting Review - Is this the best shared web hosting in 2019? SiteGround offers industry-leading support. Not only do they have near-zero wait time for support requests, but they offer multiple support channels as well. Beyond rock-solid support, SiteGround has a lot more to offer your website. Including affordable, high-performing, and secure hosting. SiteGround is a host that puts its customers first. When you’re searching for the best host for your new website there are a few key elements you want to look for. A host that’s reliable, high-performing, secure, and offers helpful customer support. Without these 4 elements, you’re going to have a difficult time growing your website. Luckily, SiteGround places a ton of importance on those 4 elements. They offer industry-leading uptime of 99.99%, that’s backed by a guarantee. Their servers are built with the latest hardware and your website will load fast. They have incredibly high-security standards and protocols, both on an onsite and server level. Plus, they have a knowledgeable and helpful support team, along with multiple support channels. No matter the kind of hosting you’re looking for, you’ll be able to find it at SiteGround. Below we take a detailed look at SiteGround , the hosting packages they offer, as well as their unique set of features, so you can decide if they’re the right host for your new website. 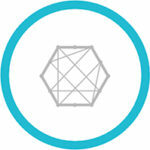 SiteGround was founded in 2004 by Tenko Nikolov, Reneta Tsankova, and Nikolay Todorov when they were back in university. Currently, they’ve grown their staff to over 400 employees. Today they host over 2 million websites, and process over 1500 support tickets, 1000 phone calls, and 3000 chat requests per day. Across the internet, it’s difficult to find a bad word being said about SiteGround. That doesn’t mean they’re the perfect host for everyone, but they have a lot to offer most website owners. Their big core offerings are their high-performance shared hosting plans, managed WordPress plans, and custom Enterprise servers, however, they offer a myriad of other hosting types as well. Free Domain Name!! – There’s not many web hosting companies that give away free domain names with their shared hosting, so it’s really good that SiteGround do this as well as providing the user with high quality hosting to boot! Lightening Fast Installation – Install most of the popular apps available as well as CMSs in super quick time with one click installs with Softaculous. Extra / Hidden Fees – Siteground will charge you a fee of $14.95 if you decide to pay your hosting fee on a monthly basis. That’s why I always recommend that you pay for the full year up front to save yourself a bit of cash. Siteground Control Panel / Dashboard – Siteground uses cpanel which is extremely easy to use. 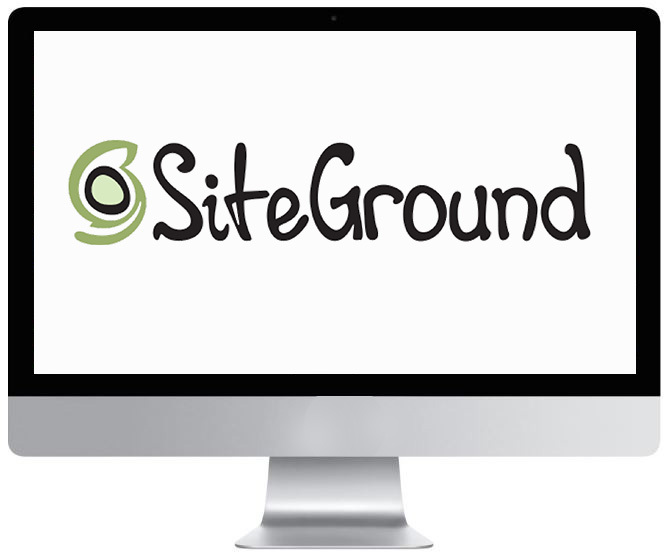 Let’s take a detailed look at the features offered by SiteGround. Siteground has very impressive and consistent uptime levels. Having a high uptime is incredibly important. Uptime refers to the time that your site is actually online. If this is your first time purchasing hosting, then this probably isn’t something you’ve thought about before. Shouldn’t your website be online all the time? Well, yes. But, there are a few factors that end up influencing your overall uptime, like time required for server maintenance, server overload, and more. 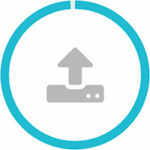 Most hosting companies will offer an uptime of around 99%. This means that 99% of the time your website will be online. SiteGround has a very incredible uptime of 99.99%, and that’s even across their cheapest shared hosting plans. They even offer an uptime guarantee and you’ll be compensated for the time that your site spends offline that extends beyond the 99.9%. However, SiteGround is so reliable this will probably never even arise. They even have a tab on their website that show their current uptime and performance, and if any issues are currently occurring. Beyond having a super high uptime SiteGround also has some of the fastest loading speeds out there. Loading speed should be one of the main qualities that you use to evaluate your web host. Without fast loading speeds, you’re not only going to rank lower in the search engines, but you’ll be delivering a poor user experience too. If your site loads too slowly your visitors won’t stick around to wait for your site to load. SiteGround has average loading speeds of 700ms. This speed makes them one of the fastest loading hosts on the market today. You might not always need to get in touch with your hosting company support team. But, when you do run into an issue that needs solving or have a question that needs answering, you want their support team to be speedy and helpful. SiteGround achieves on both of these fronts, and a lot more. SiteGround support is one of the best in the hosting game. For starters, they respond to support requests incredibly quickly. Whether you’re reaching out to support via live chat or phone, you’ll experience zero wait time. If you prefer to reach out to support via email, then your maximum response time will be 10 minutes. Plus, you’ll always be dealing with a real living breathing human. A lot of companies make their customers go through multiple touch points where you’ll be dealing with bots or automated systems. But, with SiteGround this will never be an issue. At SiteGround you’ll find 24/7 support across multiple channels, including phone, live chat, and email. Plus, support is offered in three languages English, Spanish, and Italian. There’s also a massive knowledgebase that can help walk you through any issues you’re currently experiencing, so you might not even have to reach out to support. One this is for certain with SiteGround’s support–they really care about their customers. No wait times. And a speedy, knowledgeable, and helpful support staff. It’s hard to get better than that in terms of online customer support. SiteGround truly shines with its WordPress hosting plans. They offer something unique in that all of their WordPress hosting plans are managed. This means that you’ll have a WordPress professional managing your account. So, they’ll handle things like optimizing for speed, security, support, keeping things up to date, and more. Essentially, they’ll take care of all the technical tasks related to hosting your WordPress site. Including website-related tasks like updating the WordPress core and any plugins, plus regularly backing up your site. This helps to free up your time, so you can focus on actually growing your website. Beyond the managed hosting features you’ll get access to a surprisingly powerful suite of features. Plus, if you’re a developer then you can take advantage of high-level features like WP-CLI, GIT, staging areas, and more. We cover their WordPress hosting plans in greater detail below. SiteGround takes security seriously. First, they have very high-level protocols in place to protect the physical datacenters where their servers are located. Second, they have a variety of security tools, included spam protection tools, firewalls, an AI bot protection, as well as a suite of other security tools and applications. Plus, you can activate the CloudFlare CDN on any hosting plan, which will not only improve website performance but protect your site from DDoS and other attacks. You’ll also get a free SSL certificate with every hosting plan. An SSL certificate will encrypt any traffic that passes between your server and your visitor’s web browser. The level of SSL certificate provided will depend on the level of hosting plan you choose. If you want to build an eCommerce site, then SiteGround has you covered. A lot of hosts only offer a handful of different eCommerce applications to choose from. But, SiteGround offers 18 different eCommerce applications to choose from. Not only do you have a bigger selection to choose from, but the one-click installer will help to ensure that the eCommerce application you choose is setup the right way. Beyond eCommerce solutions like Magento, OpenCart, and PrestaShop, you also have the option to use the combination of WordPress and WooCommerce to run your eCommerce store. If you do decide to go this route you’ll even find WooCommerce specific hosting that you can use to power your eCommerce site. Another great feature offered by SiteGround is the free website transfer. Some hosts will charge for this feature, or the transfer will take a long time to complete. With SiteGround not only is transferring your website to their servers entirely free, but it’ll be done within 24 hours. This speedy service is something you’ll grow accustomed to when using SiteGround. Now, this website transfer does have it’s limitations, as it only applies to users who sign up for the GrowBig or GoGeek services. If you are on the basic StartUp plan, then there is a free migration tool you can use. Plus, you always have the option to migrate your site manually. Like most quality web hosts you’ll find a money-back guarantee. SiteGround offers a 30-day money back guarantee. It’s not as long as the 45-day or even 60-day guarantees that some other hosts offer, but 30 days should still be plenty of time for you to figure out if you want to continue hosting your site with SiteGround. Keep in mind that this guarantee isn’t a blanket guarantee and there are some conditions that you’ll need to abide by if you want to get your money back. The guarantee only applies to those with new hosting accounts, and only within the first 30 days service is active. Any renewal hosting packages aren’t covered under the guarantee. Dedicated hosting isn’t covered under the guarantee. Any third-party services or add-ons aren’t covered under the guarantee. Domain name fees aren’t covered under the guarantee. To get your money back a termination request must be initiated from within your user area within the first 30 days of service. Most hosting companies only cater to the English-speaking US market. However, SiteGround is different. They’re based out of Bulgaria, which already makes them different and primed to serve a more global market. Instead of just serving the US market, they orient themselves to the rest of the world as well. For example, you can purchase hosting in multiple different currencies like EUR, AUD, GBP, and of course USD. If you’re building a small business website you can also get a local toll free line, along with a country specific domain name. Finally, they have datacenter locations all over the globe in Chicago, the Netherlands, the UK, and Singapore. When you sign up for hosting you can select the datacenter that’s closest to the location of the majority of your users. This will help to improve things like loading speed and performance right out of the gate. Another great thing about SiteGround is its commitment to transparency. This isn’t so much a feature, but more so the way they conduct business. Most online businesses can be pretty closed off. SiteGround seems to take extra effort to be transparent with their hosting practices, and support their customers in whatever way they can. When viewing their plans you’ll notice that they’re very clear on what you’re getting, and provide details about the true limits of each hosting package. Plus, you can get a detailed breakdown of their datacenter locations and the components that make up their individual servers. You can also check out the IP address of their datacenters, so you can run tests to get server speeds all on your own. There’s also a section that shows their reported uptime, how it stands currently, as well as on a yearly and monthly basis. By being forthcoming with aspects of their server hardware, technologies, and hosting plans they truly set themselves apart in an industry that’s usually more closed off. Finally, they’re one of the few hosting companies that aren’t part of a large holding company. They operate completely independently, which some users might enjoy. SiteGround has a lot going for it and could be the perfect host that you’ve been looking for. However, SiteGround still has its drawbacks. One of the biggest drawbacks is that SiteGround is on the lower end of the storage space spectrum when compared to other hosting companies. This might not be an issue, because you can always upgrade your plan, but when you’re looking through different hosting plans, you’ll notice that they are on the smaller side. The main limitations you’ll find across various hosting plans is the amount of disk space, not the number of domains, or databases allowed. When looking through the different plans you’ll see the helpful recommendation of how much traffic each plan can support. When you hit against these limits you’ll need to upgrade your account. Having less storage space might not be an issue for every site owner, but if you have a very large and or media-rich site, then you might want to consider another host. Even if you’re not getting a lot of traffic your site still might take up a lot of space, like if you’re building out a social networking site, application, or a blog with hundreds of pages. Keep in mind that other hosts sell “unlimited” hosting that can actually end up being quite limited. SiteGround doesn’t do the same thing, which is nice, but their storage caps are on the lower end for the price you’re paying. SiteGround only offers Linux servers. Linux-based web servers are the most commonly used type of server worldwide, but this still might leave some users out. If your website or application requires a Windows-based server to function, then you’ll need to look elsewhere for a host that supports Windows servers. SiteGround offers a free website migration with a super fast turnaround. But, this migration does have its limits. First, the free migration is only included with the higher level hosting plans. Second, the migration is only free for the first site you move over. If you need to bring over more than one site, then you’ll have to pay for any additional migrations. Third, the migration is only free up to 1GB of content. So, if you have a large site that you need to migrate, then you’ll have to pay for the migration. SiteGround offers a wide variety of different hosting types and packages that can suit most website owners. No matter what kind of hosting you’re looking for you’ll be able to find it at SiteGround. You’ll find traditional shared hosting, dedicated, WordPress, and cloud hosting packages. Plus, you’ll also find more niche offerings like Reseller hosting, and custom servers for Enterprise clients. Plus, all of their plans are backed by an incredible 99.99% uptime, a free domain, and the ever-popular cPanel. Shared hosting is the most common form of web hosting. If you’re building out your first website, then this is the style of web hosting you’ll probably want to go with. Every shared hosting plan is equipped with cPanel. This control panel is the industry standard for a beginner-oriented easy to use dashboard to manage your hosting account. You’ll also get access to the useful Softaculous application, which allows you to install over 400 different applications including WordPress, Magento, Joomla, and more. Each of their shared hosting plans are going to be limited by the number of site visitors you get per month. When selecting the right shared hosting plan for your needs you should choose your plan based upon the number of website visitors you’re getting per month. Every shared hosting plan is equipped with a free domain, free SSL certificate, the CloudFlare CDN, and the ability to create an unlimited number of databases. Beyond the difference in overall price the biggest differences in each plan are the number of websites you can host on each server, the amount of storage you’re given, and the number of visits your site can support per month. The StartUp plan costs $3.95 per month, the Growbig plan costs $5.95 per month, and the GoGeek plan costs $11.95 per month. 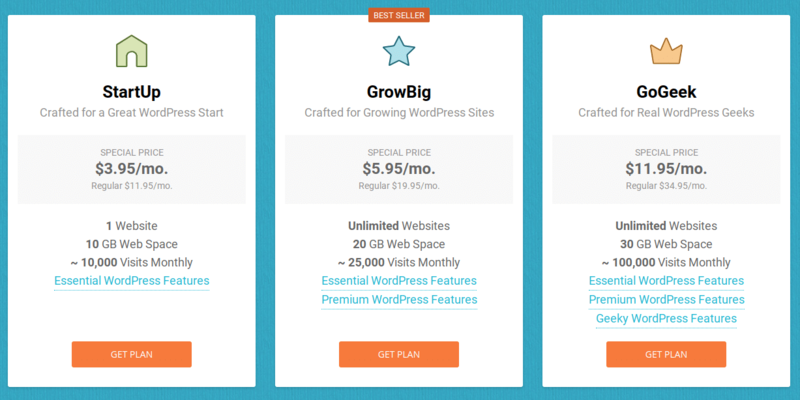 The best value plan is the GrowBig plan as it gives you the flexibility to add more sites to your hosting plan, along with being able to support more visitors. Shared hosting is going to be the best form of web hosting for the majority of users. This style of hosting is best-suited for beginners and will give you everything you need to get your site off the ground and grow it to a decent volume of traffic. Not only is shared hosting very easy to setup, but it’s packed with beginner-friendly tools and applications too. Shared hosting is probably the best place to start. In time, as your website picks up steam and you’ve reached the limits of shared hosting should you consider upgrading. If you’re running a WordPress site that continues to grow in traffic, then upgrading to WordPress hosting is a great idea. WordPress hosting can provide your site with higher levels of performance, security, along with a host of other WordPress-only upgrades. SiteGround approaches WordPress hosting in a unique way in that all of their plans are managed WordPress plans. Most hosts will only offer managed WordPress hosting when you’re paying a much higher monthly fee, but not SiteGround. With managed WordPress hosting all of the technical elements related to your account will be handled by a WordPress professional. So, things like WordPress core and plugin updates, support, maintenance, and other tasks will all be taken care of for you. This frees up your time and allows you to instead focus on actually growing your site. On top of features that’ll help support your WordPress site, you’ll also find some pretty advanced security features. For example, they have a program that’ll protect your site from bots that’s powered by their own AI algorithm. This creates a high level of security that’ll protect you against things like brute force attacks, login attempts, and more. Plus, the algorithm is continuously learning and adapting to new threats every single day, so your site will always be protected. The SiteGround WordPress hosting plans are all fully managed, which means they take care of all the technical tasks related to setting up and managing your server. Each plan is equipped with a free SSL certificate, daily backups, email accounts, a free CDN, a developer toolkit, and staging tool. Plus, your server will be fully optimized for WordPress, and your site will be protected against any unique WordPress vulnerabilities. The biggest differences between each plan are the number of WordPress sites you can create, the amount of storage space, and the number of visitors your site can support. The Startup plan costs $3.95 per month, the GrowBig plan is $5.95 per month, and the GoGeek plan is $11.95 per month. Who would benefit the most from WordPress hosting? If you’ve outgrown your current shared hosting environment and you’re running WordPress, then you’re a great candidate for WordPress managed hosting. If you’re running WordPress, then this style of hosting will help to get the most out of your site. You’ll get tremendously fast loading speeds, enhanced security, plus a team of WordPress experts behind you that’ll manage your site and make improvements every step of the way. If you’re not getting much traffic, then standard shared hosting will probably suit you fine, but as your traffic levels grow, then upgrading to SiteGround WordPress hosting is a no brainer. Cloud hosting is a very powerful and scalable form of hosting. It’s often seen as an alternative to dedicated server hosting. Cloud hosting essentially provides you with a dedicated server, but the underlying technology is much different. For example, with a dedicated server, you’re renting an entire physical server. But, with a cloud server, you’re bringing together multiple shared physical servers and pulling resources from all of those. This is referred to as a cloud cluster. The biggest benefit of this is the scalability that this offers your website. If you need more server resources, then you can add more very quickly. Plus, this form of hosting is very reliable. If there’s an issue with an existing server in your cluster, then traffic will simply be switched to another server on the network. The SiteGround cloud hosting plans are a great choice if you receive a high volume of traffic or a variable volume of traffic. Plus, cloud hosting is very cost effective as you’re only paying for the server resources you’re actually using. The Cloud hosting plans offered by SiteGround are scalable and incredibly fast. If you’re looking for a scalable and high-performing hosting package, then this is worth exploring. Each plan is equipped with 24/7 VIP support, fully managed servers, a free CDN, off-site backups, a free domain name, a bundled SSL certificate, a dedicated IP address, and pre-installed server software. Plus, each plan has advanced features like SSH access, WHM and cPanel, 7 different PHP versions, Apache and CentOS and more. The biggest difference between each plan is the number of CPU cores, memory, and storage. Basically, the larger your site, the more storage you require, and the higher your traffic the higher plan you’ll need. The Entry plan costs $80 per month, the Business plan is $120, the Business Plus plan is $160, and the Super Power plan is $240 per month. Who would benefit most from Cloud hosting? Cloud hosting is perfect for website owners who have variable levels of traffic or need scalability and flexibility in their host. Cloud hosting also provides you with very high levels of security, and a high volume of storage, while offering you high levels of performance. Users who’ve outgrown shared hosting will want to consider cloud hosting before jumping into a dedicated hosting plan. Dedicated hosting is quite simple to explain. You have an entire physical server that’s dedicated to your website and your website alone. If your website requires a ton of power, stability, security, and storage, then a dedicated server is the way to go. Dedicated hosting will generally be the most expensive form of hosting, but with that, you’re getting the resources of an entire server to support your site. SiteGround offers you incredibly high performing dedicated servers. All of their plans are managed, which means they take care of server setup, optimization, and ongoing maintenance and monitoring. Each plan is equipped with 24/7 VIP support, the ability to choose your own datacenter location, along with 5 dedicated IP addresses. All of their servers are built with high-performing server software and offer a variety of developer tools like website staging, Git integration, WP-CLI, SSH access and more. The biggest difference between each plan (besides price) is the processing power, number of CPU cores, RAM, and total amount of storage. The plan you choose will be based upon how large your site is, along with the amount of traffic you need to support. The Entry Server plan costs $269 per month, the Power Server plan is $349, and the highest level Super Power Server is $729 per month. Dedicated hosting is generally only beneficial for large and established websites. Dedicated servers provide you with the resources of an entire server to support your website. This means you’ll get extremely high levels of performance, security, processing power, and storage. Since dedicated server hosting is so expensive, you’ll usually only want to upgrade to a dedicated server if your site is very profitable and stable. Enterprise hosting is the most powerful form of hosting they offer. With Enterprise hosting you’ll have a server that’s custom-built for you by the SiteGround team. If you have a very large website and require an immense amount of server resources, or need a highly customized server, then enterprise hosting is worth exploring. Keep in mind that their team will build the servers for you, to your specifications, but you need to manage your own servers. So, you’ll need to have a technical team in place for proper server configuration, maintenance, and optimization. If you’re interested in enterprise hosting you’ll need to reach out to their team for details and pricing information. Reseller hosting allows you to create additional revenue streams by offering hosting as a service to your clients and customers. Technically, you could even build your own hosting company off the back of SiteGround servers. Since you’re offering a white label service SiteGround’s branding won’t appear anywhere and you can replace it with your own brand. To start the base level plan will give you 10GB of disk space and the ability to host an unlimited number of websites. The pricing of the reseller system is based upon a credit system. First, to get started as a reseller you must buy at least 5 credits. Each credit you purchase is equal to a single year of hosting for one customer. You can also purchase other things like domain names and additional server space, which you’ll receive at a discount. Managing your reseller account is quite simple as everything is handled within the SiteGround user dashboard. WooCommerce is an eCommerce plugin for WordPress that can transform your existing site into a full-fledged eCommerce store. WooCommerce is one of the most popular eCommerce tools in the world. WooCommerce hosting is a form of their WordPress hosting that has specific WooCommerce elements preinstalled. These hosting plans are equipped to run WooCommerce right from the start. All it takes is a couple of clicks to install WooCommerce on your site. If you have an existing WooCommerce store, then you can get a free site migration on their higher level plans. Their WooCommerce hosting plans are equipped with a free CloudFlare CDN, smart caching, and are built upon high performing servers. Not only that but you’ll get a free SSL certificate, managed updates, daily backups, built-in staging, plus PCI-compliant servers. The biggest differences between each plan are the number of WooCommerce sites you can host, the total amount of storage space, and the number of visitors that your site is receiving. The StartUp plan is $3.95 per month, the GrowBig plan is $5.95 per month, and the GoGeek plan is $11.95 per month. Who would benefit most from WooCommerce hosting? Basically, if you’re running a WooCommerce store, or want to build an eCommerce store from scratch, then WooCommerce hosting is a solid choice. The plans offered by SiteGround can support your site in the initial stages up until you’re running a profitable high-traffic storefront. Plus, since all of the plans are managed you won’t have to deal with any of the technical elements of running your online store. The high-level plans also give you the ability to create and launch multiple different WooCommerce stores. SiteGround’s hosting plans are equipped with a wide variety of hosting features to suit your hosting needs. Beyond things like performance and security, you’ll want to choose a host that provides a high level of support. When you’re running your website and an issue occurs, you’ll want this to be resolved as quickly and painlessly as possible. SiteGround places a heavy focus on providing the best support possible. They have a huge support staff that can help you with any website or server issues 24/7. Not only will you receive a fast response to any problems you’re facing, but their technical-oriented staff is actually familiar with any issues you’re currently experiencing. You can access support via live chat, phone, or email support. When you’re speaking with support you’ll actually be able to view the profile of the agent who’s assisting you. You’ll be able to see how many years of support experience they have, their level of technical expertise, and more. In regards to processing support requests, they use load balancers to ensure that support requests are spread evenly across their available agents. 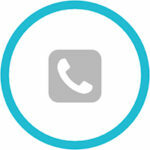 This helps to ensure that you’re in communication with an agent as quickly as possible, usually within a few seconds. SiteGround provides support for everything related to hosting, add-on services, applications, and more. For example, they provide dedicated Magento support, if you’re on one of the Magento hosting plans. You’ll also find a massive knowledge base, a wealth of support tutorials, and even webinars that’ll provide you with all the information you need to troubleshoot whatever issue you’re currently experiencing. When you sign up for SiteGround you’ll get access to the industry standard cPanel. If you’ve used any other web host before this, then you’re probably already familiar with cPanel. Essentially, this control panel is very easy to use and will let you accomplish complex technical tasks with a couple of clicks. One of the most useful applications is the Softaculous app installer. This gives you access to hundreds of applications you can install on your website in a number of clicks including WordPress, Joomla, and Magento. cPanel is also packed with a number of advanced features too. For example, you’ll get access to SIteGround SuperCacher. This web caching service has been built on the NGINX reverse proxy and based on Varnish and Memcached. This makes the process of retrieving web pages much faster and will greatly reduce the load placed on your server. If you’re running a WordPress or Joomla site, then you’ll also get access to the WordPress and Joomla toolkits. This lets you easily modify your domain, reset any admin passwords, fix broken permissions, configure SSL, secure your admin page, and a lot more. If you’re on the higher level GoGeek plans then you’ll get access to advanced developer features like WP-CLI, Git integration, and a site staging area. SiteGround currently supports a multiple of scripting languages including, Perl, Ruby on Rails, Python, PHP7 and older version of PHP, and the HHVM PHP execution engine. 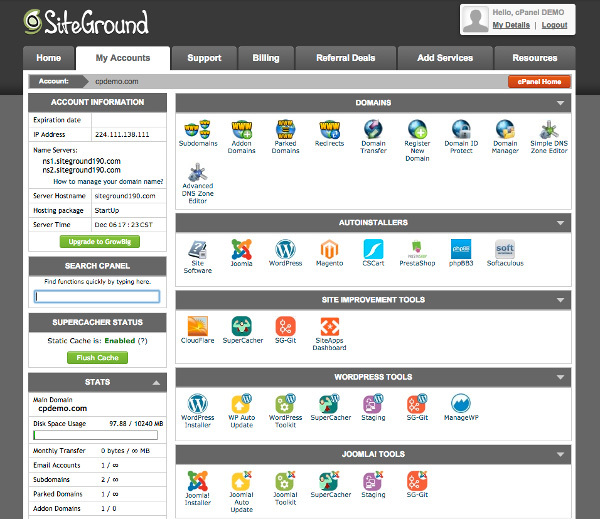 SiteGround shines with its shared and WordPress hosting plans. But, the wide variety of hosting types offered ensures that you can grow your site with SiteGround and not have to migrate hosts. For example, if you’re running a WordPress site on the basic shared hosting plan, you can always upgrade to the higher level of WordPress hosting plans. While, if you’re not running WordPress you can always upgrade to the scalable cloud hosting plans, or even upgrade all the way to your own dedicated server. No matter the type of website you’re running, or style of hosting you require, you can find it at SiteGround. No to mention, if you run a large and high-traffic website and you require a completely custom server setup you can always have SiteGround create your very own custom server setup. SiteGround takes security very seriously. First, you’ll find that their datacenters are protected with high-level security protocols 24/7. For instance, they have 24/7 personnel security, access control, biometrics, bulletproof lobbies, and continuous video surveillance. With their datacenters protected on a ground level, they also implement layers of internal security features to protect their servers, even users on basic shared hosting plans. For example, on their shared hosting servers, they implement a mechanism that completely isolates sites that are using the same shared server. So, even if another site on the same server is experiencing a security breach this won’t affect your site at all. This makes their shared servers just as secure as a completely isolated dedicated server. Plus, there are pre-existing features that help to prevent vulnerabilities and hacking attempts, like security vulnerability software that regularly scans the servers for any issues or security gaps. If any security risks are identified, then these can be patched instantly. There’s also a variety of add-ons and bundled services like HackAlert Monitoring, hotlink protection, IP address blacklists, and anti-spam tools like SpamExperts and SpamAssassin. Finally, there’s a unique feature called Leech Protect, which will help to prevent password theft and password sharing. This feature allows administrators to prevent users from publicly posting passwords to certain areas of your site. SiteGround offers a variety of different website backup options. Face it, mistakes happen, and so do unfortunate circumstances that might bring down your site. When this occurs you’ll want to have a website backup you can restore your site from. Without a backup, you might have to recreate your entire site from scratch, which can be very time consuming and a real headache. Luckily, SiteGround includes automatic daily system backups on all of their hosting plans, plus they store these backups for 30 days. On higher level plans you’ll get access to even more backup features like one-click restore, instant backup on-demand, and free instant backup copies. If you’re serious about backing up your site, then you might want to use a third-party backup tool as well. But, the bundled backups are great to have just in case. Beyond the general features highlighted above SiteGround is equipped with a handful of other features that could be useful to some people. If you want to create your own website, but don’t have any existing technical or design skills, then you can use the included website builder provided by Weebly. This drag-and-drop builder is incredibly easy to use. All you have to do is select a theme, drag and drop different website elements, add your own content, and publish your site. The builder is even equipped with eCommerce features if you want to sell your own products. Plus, all of the themes are responsive, so they’ll look good and function properly no matter what screen size they’re being viewed on. SiteGround is one of a handful of hosting companies that allow datacenter selection even on shared hosting plans. They offer datacenter locations in the UK, Chicago, the Netherlands, and Singapore. According to SiteGround, they selected these datacenter locations due to their reliability, but these locations also give you a solid global reach. No matter where you are in the world, or where your website visitors are from, you can select a datacenter location that’s in close physical proximity. When you’re choosing your datacenter make sure to choose the location that’s in the closest physical proximity to your website visitors, not your physical location. If you need to transfer your site to SiteGround you’ll have a variety of options available. Some plans include a free website migration for a single website. There are restrictions to these migrations. But, if you have a small site you can have the SiteGround team transfer it over for you in around 24 hours. If you’re migrating a WordPress site, then you can migrate your site yourself with the WordPress MIgrator plugin. This plugin is very easy to use and you can migrate your own sites quickly and easily. Finally, you can have your sites professionally migrated as well. This server is included for one site on the GRowBig and higher plans. But, if you have more sites that need to be migrated then you’ll have to pay $30.00 per website migration. If you’re a WordPress developer, then SiteGround could be a great hosting choice. SiteGround is packed with a variety of developer tools that’ll make your life easier while helping to streamline and manage workflows. Right out of the gate you’ll get access to tools like SSH access, WP-CLI, phpMyAdmin, and SFTP. While higher level hosting plans will give you access to Git integration and a website Staging tool. You can also choose which version of PHP you want to use. By default, the latest version of PHP will be installed, but if you need a previous version of PHP for a project you can apply it via your .htaccess file, or use the PHP Version tool. Finally, you’ll find a multitude of different caching options available, depending on what hosting plan you’re on. No matter what kind of sites you’re running you can speed it up with the caching options available. Beyond the features above all of your sites will be hosted on high-performing servers with a modern software stack, protected with high-level security features, along with incredible uptime and performance overall. Hopefully, the information above answered most of your questions related to SiteGround and the hosting packages they offer. Still, you might have a few unanswered questions. Yes. First, they offer a 99.99% uptime guarantee. If your site doesn’t have 99.99% uptime over the course of the year then you’ll be compensated. For every 1% that it drops below 99.99%, you’ll receive a free month of hosting, which is a pretty great deal. Your uptime will probably never drop below 99.99%, but it’s a nice guarantee to have just in case. Can you install WordPress without a WordPress plan? Yes, you can install WordPress on your site with the Softaculous app from within your cPanel. This can be installed on any plan that has cPanel. However, if you’re running a high-traffic WordPress site, then the WordPress hosting packages are worth checking out. With WordPress hosting, WordPress will come pre-installed when you sign up for a plan. SiteGround offers 24/7 support via email, live chat, and phone. Their support is incredibly speedy and they basically over staff their support team to ensure there’s always an agent available to help. They only provide customer support in English, but there’s a Spanish language YouTube channel that can walk you through various website issues. What’s the cheapest plan that SiteGround offers? Currently, the cheapest plan is their basic shared hosting plan, which you can get for $3.95 per month. This plan comes with a free domain name, along with a 30-day money back guarantee. So, you can test out the service to see if it’s right for you. What options do I have for building my site with SiteGround? Once you have a domain name and hosting secured you’ll need a way to actually build your website. If you’re a beginner, then you’ll want an easy to use a website builder or CMS. Your best option would be to either use the bundled website builder or install WordPress on your site. The website builder will be the easiest approach, but using WordPress will give you more control over your site. Yes. SiteGround is an incredible host with an even better reputation. They work hard to excel across all of the important aspects you should look for in a hosting company, customer support, performance, uptime, and security. Whether you’re going to be using SiteGround to host your first website, or you’ve built dozens of sites throughout your time online, SiteGround is a solid host that’s worth considering. Their shared hosting plans are incredibly popular, as well as their managed WordPress plans, and custom Enterprise servers. Want to leave your own review about Siteground? If it provides value to our visitors then we will publish and send you $30. Note that not all reviews will be published. To be in with a good chance of your review getting published then you will need to write valid, unique, resourceful and helpful reviews – this can be either positive or negative. All the best with your review!!! Yes, I am using their grow big plan for one year from India. It is a multisite offer. Once or twice in the early stages my site crashed due to some nasty third party plugins and locked me out of my login credentials. I used their chat support and immediately they restored it, helped me with correct plugins, advised, hand held me and also made my site SSL i.e. HTTP.. I have tried my sites on some hosting providers: A2Hosting, Namehero, Skynethosting, etc. Siteground is really different compare to others.